The tradition of the “St. Anthony” Parish-Community, Prospect, has it that, two women acquaintances, Mrs. Daphne Sorvanis & Mrs. Zoë Birbas, (residents of the Prospect region) had an idea of talking to their husbands, each a member of a Church committee, about establishing an Orthodox Church parish in the Prospect S.A. region. 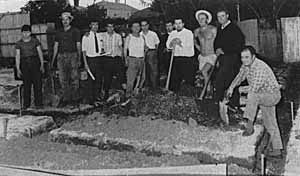 Their husbands, (Mr. Efthimios Sorvanis & Mr. Theofanis Birbas) were each respectively members of the Norwood Parish Church & Thebarton Parish Church committees. It was very time consuming and difficult to travel to those Parish Churches every Sunday for these hardworking new immigrant Greek families. It would be more convenient to have a Church closer to home for the growing Greek community of Prospect and the northern suburbs of Adelaide. As Greek immigrants it was also important for them that their children would not forget their Greek language and customs as well as continuing to worship God as devout Orthodox Christians. Thus a Greek language school had to be established closer to home, as well as a place to worship God. These two devout couples are still (as at 2010), stalwart parishioners of the “St. Anthony” Parish-community, Prospect. There were another two Committee members added who were John Kiosoglous and Haralambos Asimakopoulos (now deceased). 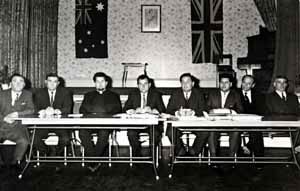 Later, in February 1968 two more members were added to this Committee, Panayiotis Alexakis and Nicholas Markopoulos (both now deceased). This Parish-Community under establishment was still without any priest, Church or other mandatory services and buildings. The first thing that had to be organised was the Constitution and the registering of this organisation with the South Australian Government. For this we thank Mr. John Kiosoglous. He ensured the recognition of the Community by the Australian authorities with a Constitution which was approved by His Eminence the late Archbishop of Australia, Ezekiel. 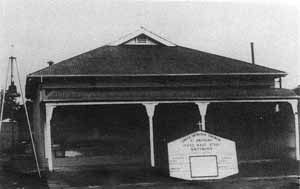 Mr. Kiosoglous had donated the largest sum of money ($600 – a large sum of money in 1968) and therefore had the honour of choosing the Saint’s name that the Parish would identify with. He chose ‘St. Anthony’ in memory of his late father Anthony (Antonios) Kiosoglous. Greek language schools were set up in 1968, one in Prospect and one in Kilburn with a total of 64 students. 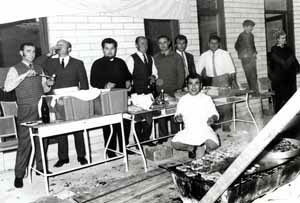 On the 9th of July 1969, at the invitation of the Patriarchal Exarch (the Metropolitan of Philadelphia Asia Minor) his Eminence Iakovos (caretaker Bishop of Australia at that time), the Reverend Angelos Drapaniotis arrived to take up his ministry at the newly established Parish-community of ‘St. Anthony’. Father Angelos had been ordained in Athens Greece, as Deacon on September 3rd 1967 and Priest on May 22nd 1969. With borrowed liturgical vessels from other Greek Parishes in Adelaide, the Divine Liturgy was celebrated in an Anglican Church hall on Gloucester Street, Prospect. This hall space (no longer in existence) was donated free of rent by the Anglican Church of Prospect for the use of the local Greek Orthodox Christians in Prospect. 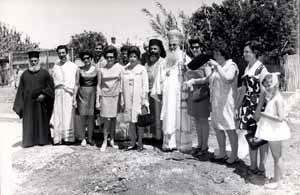 On August 10th, 1969 Father Angelos established the Women’s Philoptohos Auxiliary of Saint Anthony. Comprising hardworking ladies of the parish, the work done over the years by the Philoptohos for our Church and Community has been priceless. In September of 1969 two houses were purchased in Milner Street at numbers 65 and 67 (next door to each other). One was used as a temporary residence for the priest and the other was converted by voluntary labour into a “House of Prayer”. 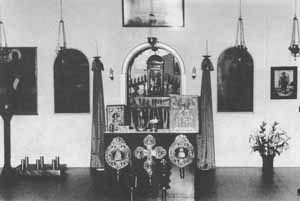 On the 30th of November, 1969 the residents of Prospect attended the first Holy Liturgy conducted at this “House of Prayer” which was decorated with Consecrated Vessels from Greece. This converted house was then used as the place of worship for the Parish-community until February 1972. 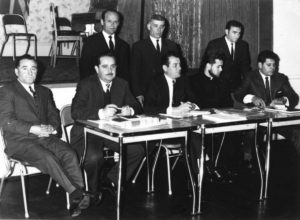 At the 2nd Annual General Meeting (AGM) on the 26th of July 1970 a local building contractor, Mr. Petros Panagopoulos put forward a motion that he would build a Greek School-Hall free of charge. This enthusiastic suggestion was applauded by all. The plans and supervision of the school building were undertaken, again, free of charge, by local Architect Mr. Nick Rossis. This would be used to conduct Greek Language classes as well as a Hall for various Church Functions. On the 20th of December 1970 the late Archbishop of Australia, his Eminence Ezekiel, celebrated the Sanctification Service for the foundation of the school and blessed the foundation of the school building (today’s Church Hall). With generous donations from young and old it was quickly erected by voluntary labour from Mr. Panagopoulos (builder), Father Angelos, the Church Executive Committee, the designing architect, Mr. Nick Rossis (architect) and other helpers. All the electrical work was completed again, free of charge by Mr. Panayiotis Kontos. On the 6th of February 1972, at the Annual General Meeting, it was decided that the foundation stone for the construction of the Church of Saint Anthony should be laid, as set out in the plans of the architect Mr. Hercules Tsakalidis, and approved by the Greek Orthodox Archdiocese. Due to the “economically weak” Community the bank would not give out a loan until various pious members signed on as guarantors to the loan. 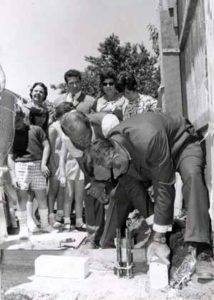 The foundation was blessed by the then Archbishop of Australia, the late Ezekiel and a time capsule was buried in the foundations containing the Minutes of the foundation signed by the Archbishop. The names of members, donors and parishioners were also placed in the foundation as an “Eternal Memorial.” Donations started pouring in from the Archbishop right down to even children present at the foundation blessing. The Kapetas Brothers undertook the building contract for the amount of $95,140. Mr. Panayiotis Kontos, always willing to assist, generously donated and installed the electrical system of the Church. In mid November 1991 the Hagiographers (artists of Holy Icons) Constantinos, Thomas and Nicholas Vrousgos (all brothers) with their assistant George Giannousis were invited to come from Thessaloniki and undertake the hagiographic writing (painting of icons) of all the internal walls of the Church as per tradition. This also was accomplished within a few months through the generous donations (a total of $90,000.00 was donated in the space of eight months) of the faithful parishioners of ‘St. Anthony’ and others as well. Today the internal atmosphere of the Church has a spiritually comfortable ambience due to the beautiful iconography covering the walls. It is a great comfort for worshipers of almighty God to see the faces of his Saints looking down upon them during the celebration of the various Sacred Mysteries. The Saints are the inspiration and a good example of Christian living for all us still in this life. The Angels and Saints are not separated from us, but as the Church Triumphant participate mystically with us the Church Militant as one body, one Church, one communion in Christ our Lord and God. In the year 2000, Father Angelos, after thirty one years of faithful service to our Parish, resigned his Rectorship from Saint Anthony Church and immigrated back to Greece with his family. In May 2001 after a period of a few months in which various priests served on a temporary basis, Presbyter John Scherstobit, was appointed by his Eminence as Rector of Saint Anthony Church. The priests that served during the period prior to Father John included Father Spyridon Vounassis, Father Panayiotis Photakis and Father Seraphim Mentzelopoulos. Father Seraphim was later was ordained to the Episcopate and served in Adelaide for a period of time as his Eminence’s Assistant Bishop with the title “Bishop of Christianoupolis”. He currently is the Metropolitan of Piraeus in Athens Greece. In this fallen world everything grows old and decays including Church edifices. In April 2003, work commenced on replacing the windows of the Church with aluminium frames since the original wooden frames had rotted away. This work was completed by one of our parishioners, Mr. Michael Lipapis to whom we are truly grateful. Once again, donations and support starting pouring in from our parishioners and the material cost of the windows was paid off in a no time at all. On the 1st of August 2008, Reverend Father Nicholas was appointed by his Eminence Archbishop Stylianos as the new Rector of Saint Anthony Church who is our present Priest and Spiritual Leader. The pastoral work of the parish continues as it has from the beginning offering spiritual and material sustenance in the forms of Sunday School, the Women’s Philoptohos Auxiliary, Our beloved Youth Committee under the Spiritual Guidance of Father Nicholas, The Bible Study classes held by Father Nicholas, Regular English Liturgies and more. As time rolls by so things also change and roll by in this flowing fallen world. Many of the original parishioners including office bearers in the Church Committee have passed on into eternity. May the Lord God forgive them their voluntary and involuntary faults and grant them a place in his eternal Kingship.